Located in Centro, the Hotel Sacromonte is five minutes from Granada Cathedral and offers air conditioning, an express check-in and check-out feature and a 24 hour reception. The hotel is a five-minute walk from many attractions including the Madrasah of Granada and Royal Chapel of Granada. The hotel provides a concierge service, as well as car hire and bicycle rental. A ticket service, luggage storage and a tour desk are just some of the facilities that this historic hotel has to guests. The hotel also offers ski lockers during the winter months. The rooms at the Hotel Sacromonte were refurbished in 2004 and have complimentary toiletries, a private bathroom and a hair dryer. A bidet, a flat-screen TV and an in-room closet can be found in each room of the hotel. Situated close to a number of hot spots, the hotel is near many bars, nightclubs and popular places to eat. The Monastery of Saint Jerome is within a short 10 minute walk of the hotel. 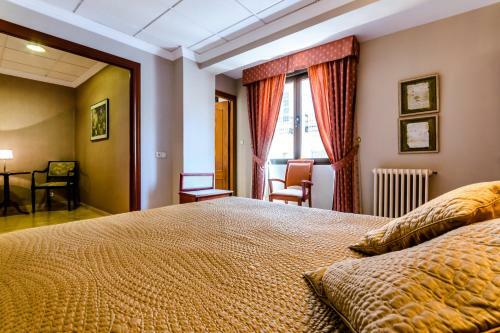 This hotel is 1505 metres from the Alhambra entrance, 511 metres from Plaza Nueva (the absolute centre of Granada), 1424 metres from the train station and 3018 metres from the bus station.